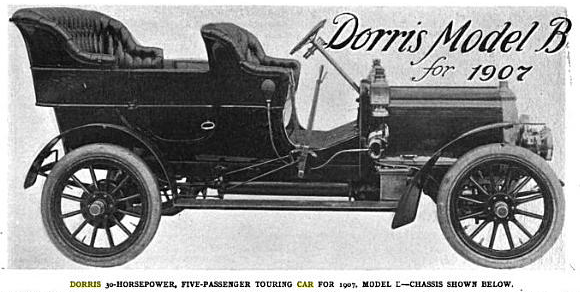 Model B, the Dorris car for 1907, manufactured by the Dorris Motor Car Company of St. Louis, Mo., is a 30-horsepower four-cylinder touring car of moderate weight, moderate cost and with ample room for five persons. The lines, generally speaking, are of the accepted touring car type throughout, but the car bears the stamp of individuality in many details. 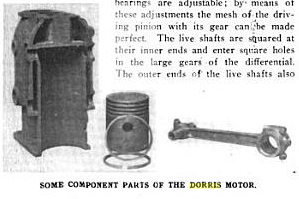 That the Dorris is capable of withstanding not only ordinarily hard road work, but extraordinary and abnormal stresses, was shown in the recent economy test of the New York Motor Club. Though the car had to be shipped home finally, it was through the giving way of an old and worn part, fractured while the car was trying to buck through a snow-filled mountain pass that had forced a much heavier and more powerful car to turn back. 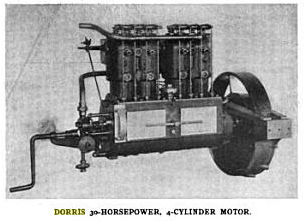 The Dorris motor has its cylinders cast in pairs with the integral water jackets; the cylinders have a bore of 4 1/4 inches and a stroke of 5 inches and the rated 30 horsepower is developed at 1,000 revolutions a minute. Pistons are very long, to give a large bearing area and to maintain the compression. Four lap-jointed rings are fitted, and these are finally finished to exact size after the joints are made. The pistons pins are of tool steel 1 inch in diameter and are clamped immovably into the connecting rod ends; in the piston bosses are bronze bushings, each 1 1/2 inces long, in which the pins oscillate. There is thus a bearing area of 1 inch by 3 inches, and the pin is positively prevented from working out and scoring the cylinder walls. Lubrication is an easy matter under these conditions, the oil from the cylinder walls working into the pins gearing very readily. All the valves are mechanically operated and are of the same size and design. Opening directly through the cylinder heads with their stems pointing upward, they are operated through rocker arms and long push-rods extending upward from the camshaft. The valve cages in which the valves are seated are ground to their places in the cylinder heads and are held by bronze nuts. The rocker arms are bronze bushed and oscillate on a tubular shaft with a wick oiling arrangement that insures constant lubrication. The camshaft is made of a single bar of steel, with the cams integral and the whole is hardened. Guides carry the lower ends of the pushrods, with the rollers which take the cam thrust. Connecting rods are of I-beam section with the big end bearings of Parsons' white bronze. The caps on the big ends are each secured by two special bolts 7/16 inch in diameter with 20 threads to the inch and castellated nuts locked by cotters. The bearing is 1 11/16 inches in diameter and 2 3/8 inches long. The manufacturers state that the bearings are capable of running six or eight thousand miles before adjustment is required. When it becomes necessary to make any adjustments, the cranks are easily reached by taking off plates in the crankcase there being four of these plates each 4 1/2 by 7 inches. The crankcase is made in a single piece and the crankshaft is inserted through the rear end. The radiator is of the finned tube type, the tubes being placed horizontally in rows four deep. Water circulation is maintained by a gear pump placed directly in line with and driven by, the camshaft. The timer is carried by a short vertical shaft between the two pairs of cylinders and the shaft is driven by bevel gears from the camshaft. Ignition is by jump spark, current being furnished by a 6-volt 60-ampere hour storage battery, with a set of dry cells held in reserve for emergency use. Drop-forged steel is employed for the crankshaft, which is finished to a diameter of 1 3/4 inches at the main journals. There are three journals, the one at the flywheel end being 5 inches long and the other two 2 3/4 inches long. The flywheel is bolted to a flange formed integral with the shaft. The gearbox is bolted directly to the crankcase by arms which reach around the flywheel and clutch; the unit thus formed is hung from three points - a construction method that is finding much to recommend it in actual work. Between the motor and the gearcase is the clutch, inclosed in a housing formed in the extended hub of the flywheel. The flywheel is cast with fan-blade spokes, drawing the hot air backward from the motor space under the hood. Sliding gears in the gearbox, operated by a lever of the progressive type, give three forward speeds and a reverse. The drive is direct on the high speed. All gears are nickel steel, hardened and tempered. There is an interlocking device which makes it impossible to shift the gears while the clutch is engaged. Just at the rear of the gearbox is the working brake, operated by a pedal. Final drive from the gearbox to the rear axle is by propeller shaft and bevel gears; the shaft is fitted with two universal joints to take up vertical movement and a slip-joint to compensate for the alternate lengthening and shortening of the distance between the gearbox and the rear axle. All these joints are encased and packed in grease. The differential is carried between two Timken roller bearings, as is also the driving pinion. These bearings are adjustable; by means of these adjustments the mesh of the driving pinion with its gear can be made perfect. The live shafts are squared at their inner ends and enter square holes in the large gears of the differential. The outer ends of the live shafts also run in Timken rollers. Cold-pressed sheet steel main frames, of the customary channel section, are employed, the metal being 5/32 inch think and the frame 4 inches wide at the center and tapered to the spring horns at the ends. The front springs are semi-elliptic, while in the freer a platform arrangement is used, the cross springs being placed in front and the side springs attached at their rear ends to a cross tube which extends across the extreme rear of the frame. The pull of the motor is transmitted to the body through the springs, which do not push through their forward ends, but pull through their rear ends on the cross tube. Thus radius rods are dispensed with. All springs are 2 inches wide. Solid forged steel of I-beam section forms the front axle, with which the springs are forged integral. The steering knuckles are of the reversed Elliott type-that is, the pivot is on the axle proper and the fork on the swiveling stub. The knuckles and stubs are drop forged and are fitted with hardened and ground steel bushings and a hardened and ground steel pivot bolt. Cross-rod and arms are placed behind the front axle and the connection with the steering gear is as direct as possible. The steering gear is of the rack and pinion type and is unusually well supported, being bolted to the bottom of the crankcase and inclosed in a casing which retains oil and excludes water and dirt. The pinion is made integral with the steering shaft; the rack is connected to the cross rod by a link, the joints being of the ball and socket type, adjustable. On the rear hubs are brake drums of pressed steel. 12 inches in diameter and 2 inches wide; within these are expanding rings faced with a special camel's hair fabric which is fireproof and durable. These brakes will slide the rear wheels on dry roads; they are operated by the emergency brake lever at the right side. 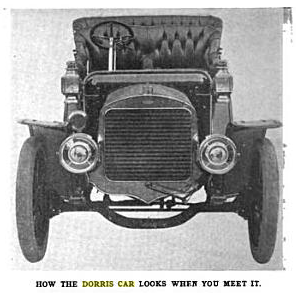 The body is made in a single piece, and the space between the tonneau seat and the back of the front seat has been increased 6 inches over the 1906 model. The dashboard is of mahogany, straight, and is finished in its natural color. The wheelbase is 132 inches and the tread 56 inches. Wheels are 12 spokes, each 1 1/2 inches in diameter, and are 32 inches in diameter, with 4 inch tires. Both front and rear wheels run on Timken roller bearings. The car weighs 2,300 pounds.